“I grabbed the binoculars and got a better look. The UFO was about 10 miles northwest of my position at first sighting. It continued South until it was almost due west of me. There it made a 90 (degree) right turn and started to climb at a 45 (degree) to 50 (degree) angle. All I could see was the pulsating (not rotating) light and what appeared to be a small cloud pushed by a vehicle I could not see. 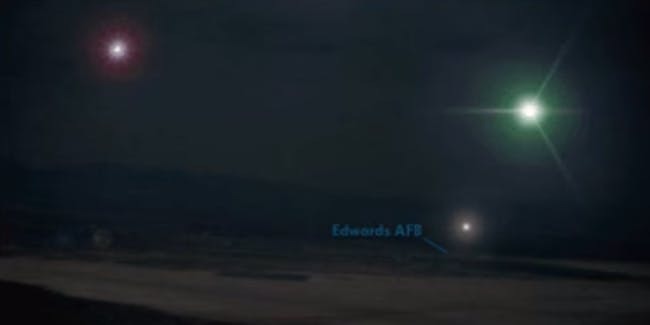 Reports of alien flying saucers and flashing lights weren’t uncommon around Edwards: Area 51 was a remote part of the base. Project Blue Book, government program that rounded up the 12,000 reports of unidentified flying objects since 1948, including the 1965 Edwards report. Four years later, the Air Force shut down Project Blue Book, declassifying most of the information, including 40 minutes of a 6-hour-long recording taken on October 7. The event remains resonant because the witnesses were extremely credible. It is not in doubt that they saw something — though it remains unclear what exactly that something was. The fact of the report’s existence — and the existence of myriad similar reports — does, however, confirm that there was a massive government conspiracy to cover up, well, something. People weren’t exactly sure just what, or the people quoted in documents weren’t anyway. Just because the truth was out there didn’t mean it was filed away beneath some four-star general’s desk. It was an anxious era, and word of the incident and Edwards didn’t make it any less so. What sounded serious then, now reads like fan fic. Maybe that shouldn’t be surprising. History quiets most of our fears while creating new ones.